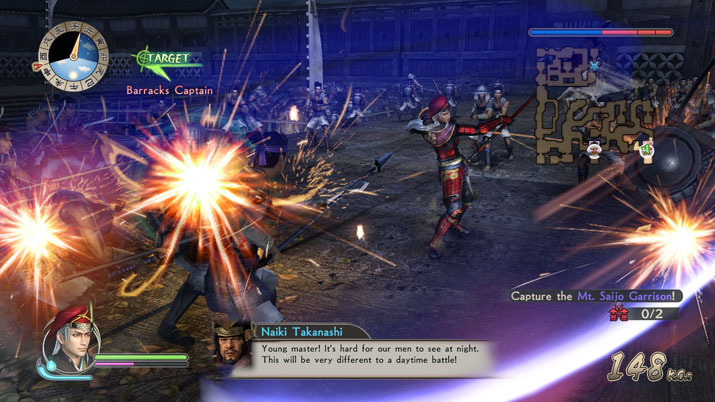 Samurai Warriors: Spirit of Sanada blends strategic planning with elements of hack-and-slash combat and takes place in historical Japan. The story focuses on the town and strategies for upcoming battles; you even see an overview of the strategy on the map of Japan before each expedition. Your primary goal during combat is not to come up with the plan, but to execute it. Masayuki Sanada, the character you start as, is a fierce warrior who surpasses expectations, yet he remains earnest and humble, focused and unwavering in his devotion for the next battle. For the most part, he’s level-headed, as are a majority of the other people you encounter — I did not sense much emotion from the dialogue, save for during the cutscenes. However, the voice acting helps complement and bolster the effect of the interlocution on the player, especially when tensions arise; the deeper you delve into it, the more engaging the story. You’ll likely spend a good portion of time in-between battles at the town, interacting with various facilities, planning and strategizing for the upcoming conflict. 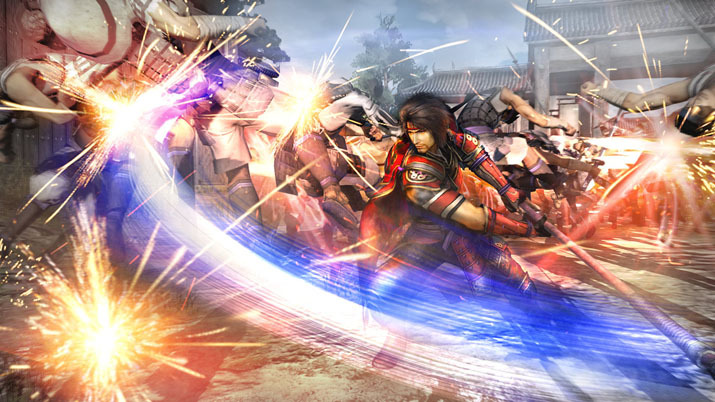 Through interactions with a multitude of people, you can obtain information about events, people, terms, and places, all of which are recorded by the Sanada Clan Chronicles. You may view this information mid-conversation whenever a word or phrase is marked in blue — you don’t have to click the button to bring up the glossary for a word or phrase in the midst of the conversation for the Sanada Clan Chronicles to record it. Speaking to particular individuals increases the number of Coins of Sanada you have at your disposal (there are other ways of obtaining more of these coins). As you progress, you unlock more facilities in the castle town, along with more aspects of your characters to upgrade. Between the pond, farm, and Jizo statue, to which you may donate an offering, there’s always something to do when not fighting to the death (if you choose to make use of these facilities). But, you must participate in a battle or exploration trip before you harvest your crops or collect your item from the Jizo statue. You can fish at any time, provided you have bait: any insect you have in your inventory; or chum balls, which, after each battle, you’ll have three at your disposal. Further, each of these is interactive. You don’t merely click the button to fish, then automatically catch something. Rather, there is a gauge that fills up, and the line must cross a certain threshold to be successful (though, I’ve had luck if the line is just before this threshold). Wait too long, and you lose the fish. The rarer the fish, the smaller a window of opportunity to catch them, and the gauge fills quicker. When preparing the land to plant seeds, you must tap a button. The quicker you do this, the higher your rating, and the more crops you’ll harvest. When you go to the statue, you have three choices from which to select your prize. You see what’s in each bag, but the bags are shuffled before you can pick. At the blacksmith, you can upgrade a character’s weapon, if you have the materials and gold. There are nine skills that you can apply to a weapon, but any weapon can hold up to eight at most. Each weapon starts with just two slots available, but by using the character and increasing his proficiency with the weapon, more slots unlock. Going on frequent explorations and making use of the gifting system tremendously assists you in the acquisition of needed materials. However, it seems that some individuals to whom I’ve given gifts are not always available and do not reappear until the story progresses. There’s also a training dojo, at which you may train various characters by distributing Clan EXP to level up a character, or gold to raise someone’s attack level. This allows you to perform longer combos while playing that character, or increase the amount of Musou bars you can fill. An abundance of gold wasn’t an issue — all of my money went to the blacksmith and dojo, to ensure the characters I used most often were battle-ready. Planting high-rarity seeds, and selling what you harvest, is a good way to replenish your funds quickly. 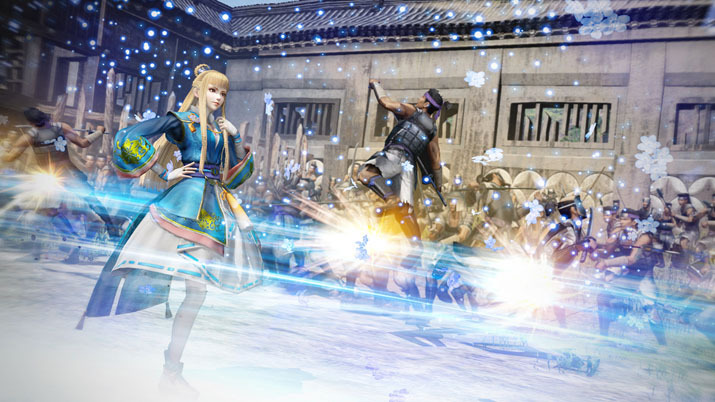 Over-leveling seems to be an issue if you frequently go on explorations and replay a few stages, considering a Musou attack could eliminate an enemy officer that is at full health. Even so, on occasion, I would find myself requiring a health tonic. This issue of over-leveling decreased and stabilized when hitting the three- to four-star difficulty boundary in chapter four. Your first mission is an exploration task with a time limit, but there are times in which you may explore an area freely, in the sense that while there is still a time limit, this only limits how long you are permitted to search the area, but you may extend this limit later, as there is no task you must complete. The only way you could ‘fail’ here is if you die. Exploring an area allows you to gain more experience, gain more materials, and complete more goals. Once you can gift an item to an individual, and raise that person’s friendship level to max, you might have the opportunity to bring the person along on an exploration trip and play as that character. If you give the right gift, you’ll get something in return. It’s prudent to note which individuals offer what as a thank-you gift, as this isn’t a one-time thing. Often, I will give away a bunch of items for which I have no need, to obtain items which I can use to upgrade my weapons or that are worth more in a store. Later, you’ll unlock a facility and have the chance to use the items you’ve collected to unlock additional characters. Multi-stage battles feature individual stages that, once you complete these, advance the story to the next chapter. You may not redo individual stages once you complete a multi-stage battle until after you unlock the library. Each stage has its victory and defeat conditions. Not only do you lose a battle if your character dies, but also if you meet a defeat condition, such as letting an enemy officer invade your base or kill a particular ally. If you lose, you won’t lose any experience or proficiency you’ve gained, and any Coin of the Sanada or medicines are refunded to you. Hence, not only should you focus on the enemies you are facing, but also to the map, various officers and their locations, your base, and any companions you have. You may switch to another player you brought with you, or give him a command, such as waiting in a spot or targeting an enemy officer. While combat implements hack-and-slash elements, there is a great deal of strategy and time management you must employ to win a battle. This is daunting at first. I tend to view the map and note locations of officers and routes I may use, and, when in combat, tend to ignore the hordes and head straight for enemies that have a name or title above their head. Once you defeat these, the horde will likely scatter and run. Along with victory conditions, there are also optional objectives and feats, which often involve killing a certain officer, defeating so many enemies, or preventing supply soldiers from retreating [EN: Nice]. Accomplishing a particular objective or feat unlocks a stratagem to use in the subsequent battle. Stratagems can turn the battle in your favor, and use up a Coin of the Sanada. I often do not employ a stratagem, unless a part of a battle proves pesky. In one battle, where you must avoid search troops, I used one to give those troops false information, buying me more time to reach my target. These stages prove useful for training characters (even more so than an exploration trip), and obtaining or improving a battle accessory, but if it’s materials you’re after, visit an exploration map. For gold, you're apt to acquire more from a stage. These accessories are available to all characters and improve a stat. On occasion, you may obtain a higher-level version of one; any duplicates or lower-level versions convert into gold. Completing a multi-stage battle grants Clan EXP, which you may use to train officers (characters you play as, and bring with you, during a battle) at the training dojo. Combat is hack-and-slash, but there are additional features: namely, your spirit and Musou gauges. Through training, you unlock a few extra charges to fill. The former permits you to perform an evasive technique, whether defensive and avoiding an attack, or offensive and forcing yourself through enemy lines, while the latter allows you to perform a special attack. You can also use a spirit charge to go into a rage mode, making it easier to break an enemy’s guard stance and wreak havoc. Or, you may fight on horseback, or use your mount to traverse the map quickly. In combat, I prefer the mount to lessen the density of a crowd by mowing them over. You could stay mounted throughout a fight, but movements are typically less precise unless you find a way to control it perfectly. Certain maps feature rifle-wielding troops that knock you off your horse. I did not notice any hiccups. The game ran very well, save for when my laptop was running on battery power and a horde of enemies surrounded me. There was also one time when the dialogue (in the written text form) was in Japanese, not English, during an exploration trip. I did not encounter any bugs or glitches, after exploring every inch of the castle town and some of the exploration areas, speaking with multiple people, and replaying a few stages. Samurai Warriors: Spirit of Sanada is superb, easily dragging a player into the gameplay with the ability to train multiple characters and play as them, along with the replayability of the stages. The combat is a breeze if you’re a higher level than what the area suggests (based off of its difficulty rating). But, these stages always require that you execute the strategy and plan set forth, while paying attention to time and your allies, being careful not to let your leader find himself in a dire circumstance. I recommend this to fans of the Dynasty Warriors series and to fans of hack-and-slashes, RPGs, and strategy-driven titles, especially ones with a historical theme.